My calls to my brothers iphone get duplicated to his wifes ipad - how do we stop that? My brother has given his Ipad to his wife. I have removed a Facetime on my iphone (as well as I can). She still gets buzzed with every call from mine to his iphone, seemingly via Facetime (they have kept Facetime). How do we stop that? I can only assume that the iPad is configured with his Apple ID. If so, he needs to sign out of iCloud on her iPad with his Apple ID and then sign in with a different Apple ID and one specifically for her. 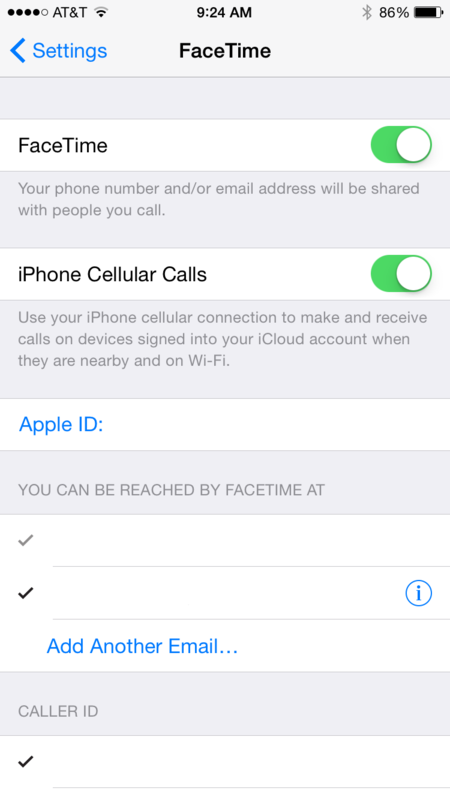 On the iPad go to Settings > FaceTime and turn off iPhone Cellular Calls. Alternatively it can also be done from the iPhone if he doesn't want his calls going to any iCloud device. What are the latest mobile game apps to intro anyone?? How do I erase Facetime completely?. Why can't I buy an iPhone 5s?